Today should have been a Character Assessment post, but I didn’t get home from Target until 8:00. After some brief aerobics, I looked at my to-do list, and there’s a lot left on it. Those assessments can take upwards of four hours, and I haven’t even picked a character for my next one yet (though I don’t lack for suggestions from all of you lovely people). I also have numerous creative projects going on, so it would just be better for me to save my assessments for a less hectic time. I’m not giving up on them; they’re just being shelved for a while. I’m going to cheat a little bit, or I suppose I must say “meta” cheat since my favorite ability is actually a combination of abilities, and its a glitch. Final Fantasy VI’s Vanish-Doom technique. It’s a bug in the system that damn near everyone used, and since this was before the internet exploded, I have no idea how we found out about it. Maybe Nintendo Power? I didn’t really talk to my school friends about Final Fantasy, so it wouldn’t have been that. Regardless Vanish-Doom got us out of so many sticky situations. I’d use it if I were losing a battle and needed a quick out (also Phoenix Down or Life for undead enemies. Take that Phantom Train!). I guess it doesn’t really count as an “ability” since every character could learn it. If I had to give a real answer, uhhhh…Meteor. 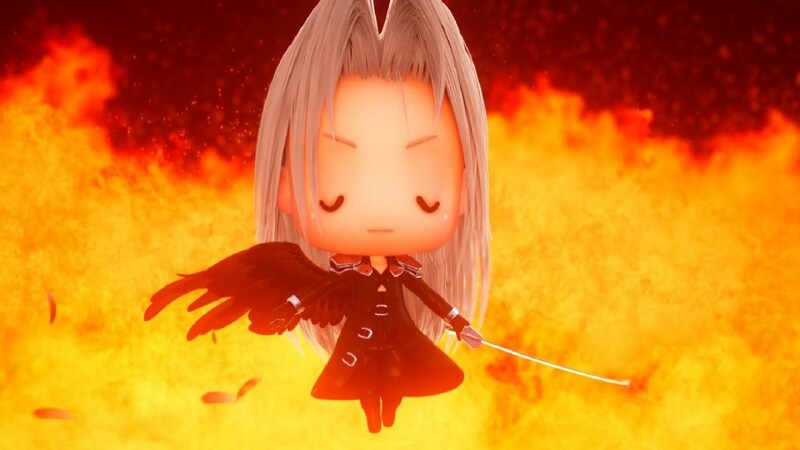 Don’t force me to give real answers…I’ll almost always default to Sephiroth if I can. What ability would you use to crush your enemies? Is it a cheat one like my initial or is it a “legitimate” one? Feel free to use games outside of the Final Fantasy franchise! Also, Mime is the greatest. I…must make such a confession, too. Look, if they’re not going to check their glitches, they can’t expect players to NOT exploit them. There’s a similar one in FFIV. Have you ever used that one? FF XIII’s card game was the first mini game of its type that hooked me though not until my second playthrough. I wouldn’t leave an area until I had ALL the cards! Whilst that notion is an unfortunate circumstance of modern gaming, I’m surprised Square Enix haven’t jumped on the chance to release a card game. That’s a good point to be fair. They could easily do Triad without too much trouble I would have thought. Then again, they’d be going up against Hearthstone and Gwent which might not go their way. True. They do have history and a vast pool of characters to work in their favour though. Some sort of CCG themed battle game using their back catalogue of characters could work well with the right mechanics. Until they start monetising it of course. Haven’t tried it myself, so I can’t vouch for its contents. But it looks like they at least transplanted the FFVIII original in there, and that was probably the best sidegame the FF series had. I need to do some finagling with my Kindle in order to play it. Technically, you can only download stuff from the Amazon app store. Only Android products get Google Play…legitimately. I’m more than willing to pay for apps on it, so it kind of blows that you can’t do it through the Kindle. I attempted to download TT, but I don’t have Google Play or a device that can take it. I DID find a way to possibly get it on my Kindle, but I have to do some fancy shenanigans that it’s a bit late to hop into tonight. There’s a version in the Kindle store, but it’s not the same as the Google Play one, which looks indistinct from the game version. FFXIII has a card game, too?? I’m looking even more forward to playing it! That’s one thing you can say for Final Fantasy: it always has innovative systems nor does it completely repeat either magic nor batter mechanics in each installment. I loved the Junction system, and even the leveling obstacles didn’t bother me in VIII, because if you Junctioned properly, you could pretty much own anything (especially if you spammed the Aura ability). *shivers* True that…like were they still aware and trapped in a card? You didn’t actually kill them; you just got their HP down low enough to Card them. This probably seems obvious, considering my penchant for writing fantasy, but I’ve always liked the use of black magic in FF. The triumvirate of fire, ice and lightning in particular as well as the path to unlocking the Ultima spell. I like how it pretty much established (in games at least) or at least helped solidify (I’m sure Dragon Quest/Warrior used something similar) the big three in the black magic field. Spells that transform the enemy and/or party. Toad (especially in FFII, where enemies turned into toads just hop away, and FFIII, where you need to use it on yourself to enter certain areas), Imp (which has its own set of equipment), Chicken (in Final Fantasy Tactics, where lowering enemies’ bravery enough turns them into actual chickens), etc. They’re only useful in a few of the games, but they’re a lot more interesting than more generic status conditions like sleep and silence. I loved how you could exploit it on a particularly hard enemy you wouldn’t expect it to work on either lol. My favorite Final Fantasy ability would probably be Dark Blade/Soul Eater/whatever else they have called it throughout the series. Being able to use health as a resource for a more powerful attack instead of MP is really awesome because health is a lot easier to recover. And while the Bravely games don’t technically fall into the category of Final Fantasy (they may as well since they have all of the same classes and spells), those games are an excellent execution of the Dark Knight class. Being able to spend all your health on dark damage and then dealing a ton of damage when you die is pretty broken. Blood Sword is another one! I like that ability, too, because usually the damage dealt is much more than the health taken. They’re pretty much Final Fantasy for the handheld hehe. I’ve only played a little of the Bravely demo, but that was my takeaway, too. Probably Sabin’s Blitz, since it made a traditional turn-based RPG feel like Street Fighter with all of the different directional inputs. Dragoon is my favorite job class in the series, so Jump holds a special place in my heart. I was going to say Sabin’s Blitz as well. Made for a bit of fun input in an otherwise menu-based system, really helped break it up. Also, it let you suplex a train, which holds a very very special place in my heart. I can definitely see how that would appeal to players who’d like more action! I, as stated, sucked so badly at it hehe. I could sometimes get Pummel and Air Blade, but Bum Rush was completely beyond my skill level. I was fine with Suplex because it was just buttons and straight directions. Dragoon is one of the original jobs! I’m a big fan of Freya from IX, and the Jump move is one of the most useful abilities in the entire series! I guess you *can* make her one since the job board is open to the player, so fantasy fulfilled! Limit Breaks, in whatever form they take. They enhance drama of combat, letting you execute a stored up super move during tense moments. It also helps flesh out the characters mechanically, especially in games like 7 or 8 where they are essentially interchangeable outside of their limit breaks. It makes the characters more individual in battle I’ll agree! VI also pretty much made them homogeneous once everyone had access to magic (though every did still have their own particular skill)..
I’ve been replaying FF6 and have been using Sabin as much as possible. When I was a kid I never could execute his moves. But after years of Street Fighter and other fighting games, now they’re easy to pull off. I’m going to say the Moogle Toss ability in FFXIII-2. It’s both entertaining and useful, haha.